Featuring some of the top athletes to appear for the University of Georgia, 2015 Panini Georgia Collegiate is a multi-sport set dedicated to the UGA Bulldogs. The simple product promises one autograph or relic card per box. Strongly focusing on the Georgia football program, the 50-card base set features notable gridiron greats like Fran Tarkenton, Champ Bailey, Terrell Davis, A.J. Green, Matthew Stafford, Knowshon Moreno, Aaron Murray, Todd Gurley, Ramik Wilson and Chris Conley. Hall of Fame NBA player Dominique Wilkins is also included. Offering the top pulls in the product, collectors can find one Autograph or Memorabilia card per box from the football team. There are also parallels for the signed cards that are numbered to 99 or less. Lastly, the individual award winners are further recognized with Honors. This insert includes those players that were named First Team All-SEC or SEC Player of the Year. All the base and insert sets are further expanded with Silver, Gold and Black parallels. 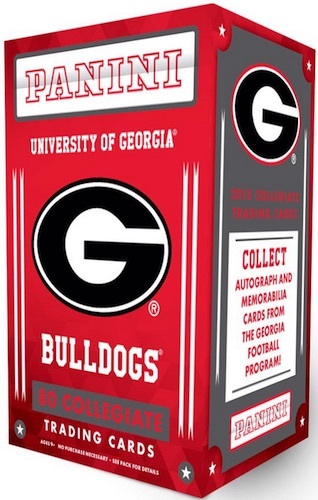 The University of Georgia is just one of the cardboard options in the Panini Collegiate line.